UPDATED: These are now stretched to produce a thicker folded word. 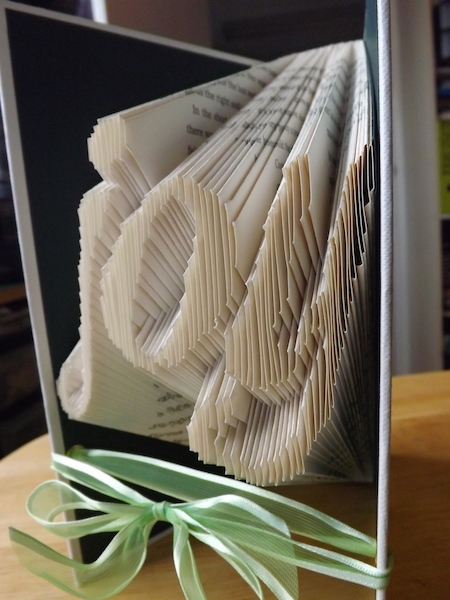 Just to go back to a question I have had a few times in comments, how to keep the folded book closed, I thought I would show you the one I did manage to do, for the word JOY. As you can see, it is tied with a ribbon, as I have suggested before, but the ribbon is tied thru a pair of eyelets, set into the front and back cover. A Crop-a-dile does the job nicely, although depending on the thickness of the cover and the length of the barrel of the eyelet, you do have to really SQUEEZE to make sure the eyelet is well set and not going to just pull loose. I was lucky to find a £1 book, where the end papers were a lovely shade of forest green. Setting the eyelets will allow you to really keep the book at the optimum state of openness, to show off the word you have folded. 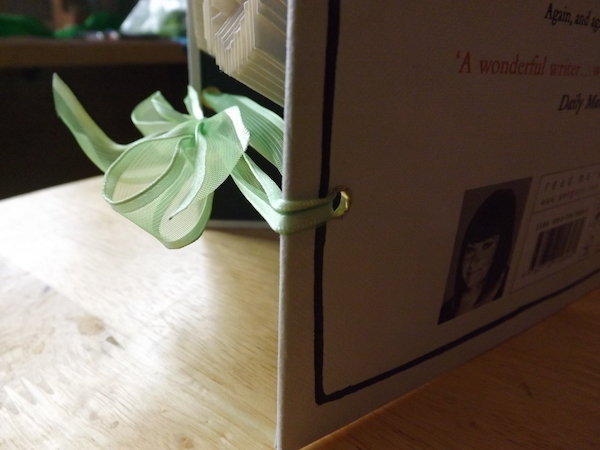 A ribbon simply tied around the book doesn’t always stay put! As I think I may have said, you could also add some dangling beads or charms, either to the bow or to the eyelet holes. I’d love to see any other ideas you might have come up with too! This book was numbered about 340 pages. I really need to be looking for 4-600 page books, but I just never seem to come across them in cheap charity shops. M❤️M. (Of course with a smaller heart.) I’m thinking with Bernard font but whatever you think looks best. I just looked at your font list again. Wondering how milk script might look with the M❤️M. Is it possible to send me both, Bernard and Milk script? You’re a sweetheart and I truly appreciate all you do! I do hope you can help, all I need is a G pattern in the style of a letterman’s jacket letter. Between trying to find a program to download to make my own pattern, the letter style or a template, I feel like I’ve put in a 40 hour work week. Thank you in advance either way. Hello I love your patterns and explanations! Would work or not? As it’s paper so a folded book seemed apt! What sort of book size would I need? Don’t mind the font though do love flowing ones! One thing I don’t get is how you centre it so there’s not loads of pages left or how you get rid of those extras? One video I watched tore them out but it ruined the look of the end design! Thanks! So sorry, I think I may have missed you out- I’ve emailed you! It really does work very well. The real beauty of it is that you can snug the ribbon tight, to keep the book very closed or let it expand quite widely, as you prefer. And it is likely to stand up a lot better because tying it in place makes it all more stable! Fun, eh?